An interesting piece of gambit, this. At first glance, one could be forgiven for thinking "Wowzers! Look at this, Ma! Instant RP!" In practice, it plays out a bit differently. First and foremost, there's no bluffing with this one if you want it to work. You'll not be rezzing this in response to someone running on the server it's in. You, sir or madam, have wasted both six credits and your opportunity. On the plus side, someone running against your RP nonsense can simply bounce of the first ETR they hit, then go after your scoring remote or key asset. OTG must be a successful run. Which means if they want to stop you scoring agendas out of hand, naked, they're going to have to hit HQ. Hard ETRs or damaging, board-resetting ICE will be your friends here. But who's got the cash on hand to rez both this and ICE powerful enough to stop a runner mid-game, or kill a careless runner early on? I think Gagarin likes this, Blue Sun as well. BABW possibly. HB Brain Damage shops could make use of it, as could a few Jinteki ID's. This could make for a hilariously over-advanced trap masquerading as an overly confident Mandatory Upgrades, Vanity Project, or even Government Takeover behind a single Whirlpool. But who would do such a thing? Off the Grid is a card that you can build a deck around. The most likely candidates being Blue Sun or Cerebral Imaging/ETF. 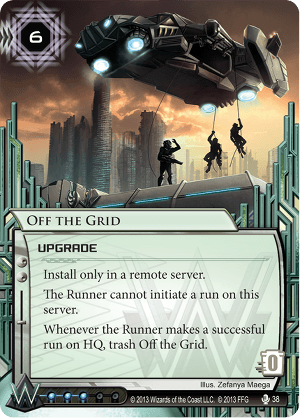 OTG has one companion card that is a must-include: Crisium Grid which means the first Successful run is wasted and will also stop a solo Eater indefinitely. Interns can and should be used to reinstall trashed Crisium Grids. A few other cards make a lot of sense in OTG decks. Breaker Bay Grid lets the corp rez OTG for just 1. Eden Fragment lets you stack ICE on HQ super deep. Eliza's Toybox, Oversight AI, Bioroid Efficiency Research and Howler allow you to rez really expensive ICE on HQ. Caprice Nisei and Marcus Batty can both be used to prevent successful runs (in Batty's case trashing a key breaker is usually the most profitable method). Interns is also useful for fishing dead ICE from Archives and installing it for free. Free installation is nothing to laugh at when HQ ICE is 3 or 4 deep. The other big problem for OTG decks is the cost of putting a reasonable amount of defense on R&D. You only have 3 OTG in deck MAX. Hurry up and score 7 points! With a deck setup like this Team Sponsorship and Jeeves Model Bioroids start sounding very nice, but the challenge there is keeping them alive long enough to use them.